Hello friends! I felt like doing a giveaway today, soooooo here it is! All you need to do is comment on this post, just a simple hello works, and you’re entered for a chance to win a $20 gift certificate to NFLSHOP.COM You have until noon on November 4th to enter. I will be picking the winner at random, so please be sure to use an e-mail address I can reach you at. Good luck and Go Steelers! in the NFL that season. 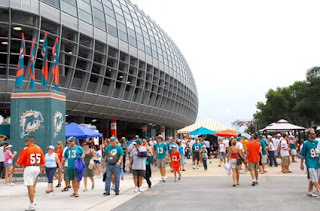 In total he has racked up, 500,000 miles and visited 500 tailgates since his start. He judged each city using four factors, parking space, tradition, family and food. By the looks of his list, you can tell the teams records were not factored in, but I still think it is a very cool thing that he did. His story has inspired me, I’m considering taking a similar journey in a quest to find the most fashionable sports fans in the NFL. I am now accepting financial backers. I can’t help but think with the Steelers having the #1 female fan base, we here in Pittsburgh have a really good chance at becoming the #1 most fashionable fans. P.S. My blog is celebrating its 2 month anniversary soon. Thanks for all of the support, I can’t believe how many people have read my blog! 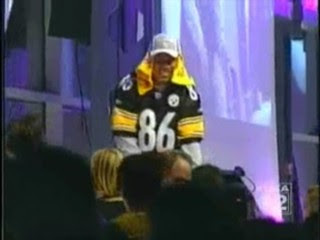 OK, so I am over the fact that I was not invited to the Steelers fashion show. My goal is to be invited to be the stylist next year. On to details about the show…. On October 8th, the Steelers held a fashion show at Heinz Field to raise money for the Thomas E. Starzl Transplantation Institute at UPMC and the Cancer Caring Center. In total they raised $750,000! While researching the fashion show I came across this photo of Mike Tomlin’s wife from a fashion show last year. Look how adorable that dress is! I’m sure you all noticed the Breast Cancer awareness items being used/worn by the players and staff during this weekend’s games. Sadly, you can’t purchase the gloves or shoes they were wearing (see below for an update on these items), but the NFL is offering an assortment of pink items. 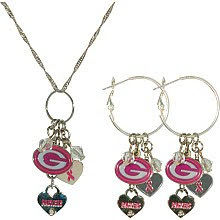 A portion of the proceeds from the sale of these products will be donated to support the fight against breast cancer. As I’ve mentioned in an earlier post, even though I find traditional jerseys in pink to be the biggest fashion faux pas, this version is for such a good cause, you can’t go wrong! *Update* There is to be a planned auction by each team for all of the Breast Cancer Awareness apparel worn during the month of October. 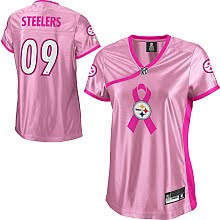 Check out the NFL Breast Cancer Awareness site for details. When you have this many fans, you become a nation. One thing I’ve always heard over the years, is how cool it is that you can find a Steelers bar in practically every city in America. I’ve even heard this from non Steelers fans! I’ve been lucky enough to visit Steelers bars in about 5 states. Each of them impressed me more than the last. Well the folks at Steeler Country Productions NYC seem to agree and have decided to make a documentary about this very subject! Here is the trailer…personally I do not particularly agree with their choice of Steelers bars in NYC, I think they should have gone to Hibernia, my old Steelers bar ….but I still can’t wait to see the finished product!